Felix of Canyon Country grabs the long-awaited solo Olympic gold; COC coach Demus disappointed with silver in 400m hurdles. 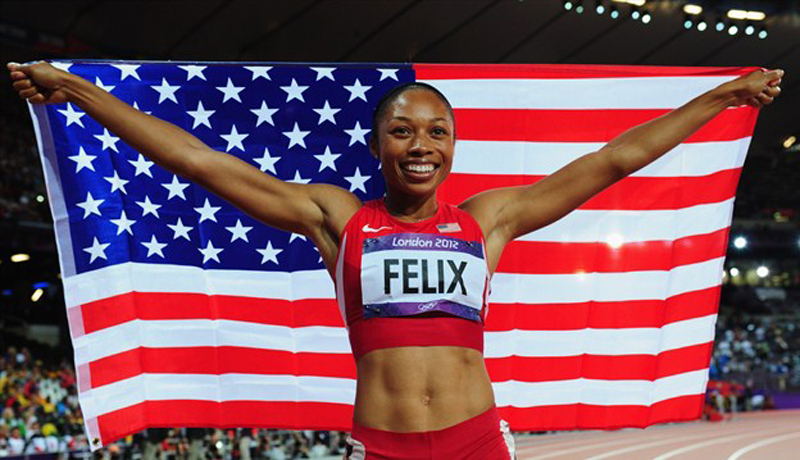 The third time was a charm as Santa Clarita’s Allyson Felix crossed the finish line in 21.88 seconds Wednesday to achieve her biggest career goal: an Olympic gold medal in the 200-meter sprint. The 26-year-old Canyon Country resident was heavily favored to win the 200m, her signature event, after coming away with silver behind Jamaica’s Veronica Campbell-Brown in 2004 and 2008. 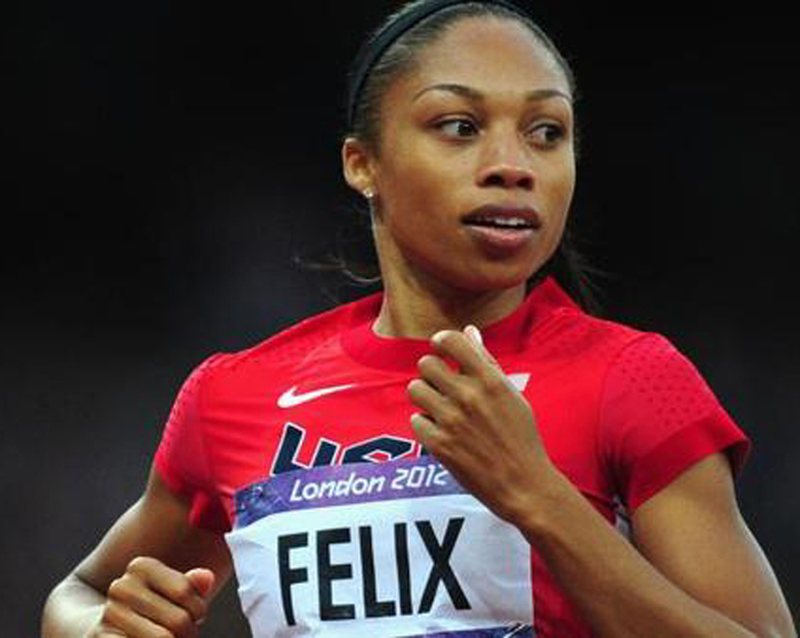 Always a strong finisher in the 200m, Felix overcame a slightly slow start Wednesday and poured on the steam as she rounded the bend, crossing the line 0.21 ahead of Jamaica’s Shelly-Ann Fraser-Pryce. American teammate Carmelita Jeter took bronze and Campbell-Brown finished fourth. No woman has ever won an Olympic track and field event three times. Felix’s time was just 0.06 off the world record. 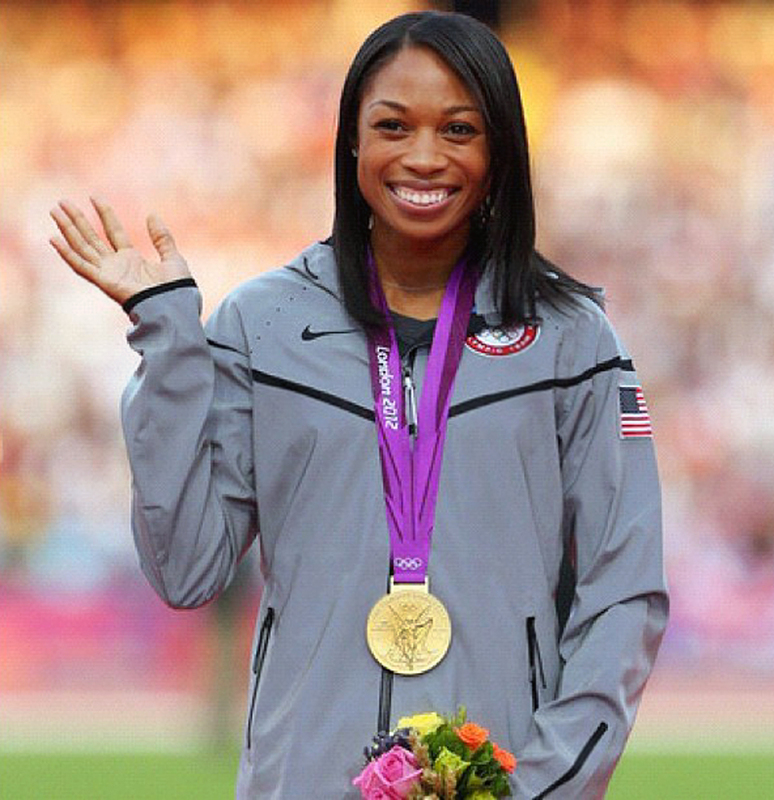 It was her first individual Olympic gold; she won gold in Beijing in 2008 as part of the U.S. 4×400 relay team. “I’m so thankful to God just to have this opportunity,” the L.A. Baptist High School grad told NBC after the race. 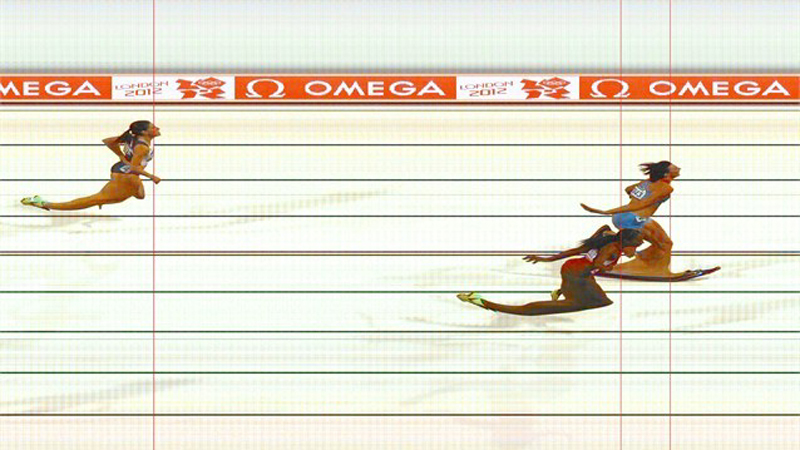 “I just wanted to keep running and dive for that line – you just never know.” It wasn’t really all that close. Fitness.gov is a project of the President’s Council on Fitness, Sports & Nutrition that has partnered with Team USA to bring 1.7 million free or low-cost physical activity opportunities, including expanded after-school programming, to youth across the nation. Demus finishes a close second in the 400m hurdles. Fifteen minutes before Felix ran, Palmdale’s Lashinda Demus – an assistant track coach at College of the Canyons in Valencia, who works out at COC – took silver in the 400-meter hurdles behind Russian Natalya Antyukh, who turned in a personal best time of 52.70. Demus, who came in right behind her at 52.77, was considered a favorite to take gold.The 28-year-old mother of two was the reigning leader in the 400m hurdles, winning gold at the 2011 world track championships in Daegu, South Korea, with a time of 52.47.”Of course I wanted the gold medal and I will not stop until I get the gold medal. You will definitely see me in 2016,” Demus told NBC afterward. This time she doubled up with the 100m sprint instead of the 400m. 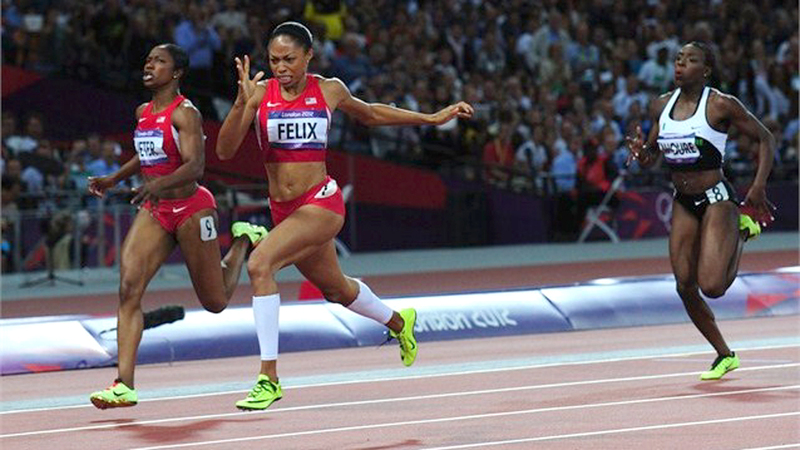 Felix finished fifth in the 100m in London over the weekend (Fraser-Pryce took gold), but it was an effective warm-up for the 200m that allowed her to practice her takeoff. Evidently it worked. 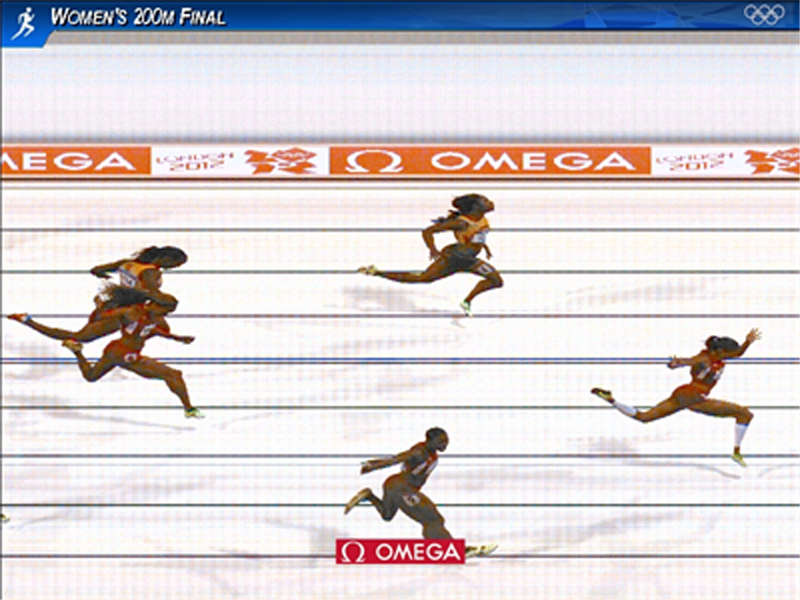 Felix’s time in the 200m in London was 0.34 better than Campbell-Brown’s gold-medal time last year in Daegu. She’s not done. Already a women’s record holder in international competition with eight gold medals coming out of Daegu, Felix will see if she can make it 10 by helping the U.S. team repeat its Olympic gold-medal performance in the 4×400 relay Saturday.